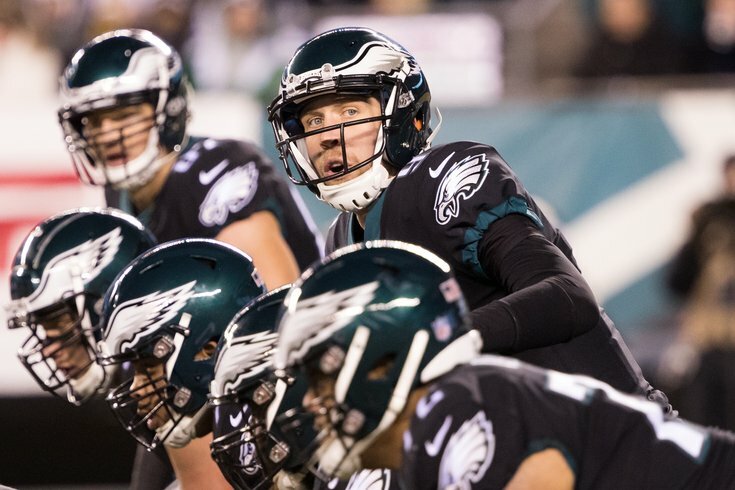 All season long we've posted our 'five matchups to watch' for the Philadelphia Eagles' upcoming opponent bright and early on Wednesday morning. In this completely meaningless game against the Dallas Cowboys, there aren't much in the way of matchups to watch, but my OCD will not allow me to skip this post. So, as always, here are our five matchups to watch. Doug Pederson seemed to hint on Tuesday morning that Nick Foles would play in the Eagles' regular-season finale. "I can't worry about [injuries]," he said. "I got to play and get him as many reps as he can, and then be smart about it. We have a lot of football left. Our season really is just beginning, quite honestly. But we'll be smart and make good decisions there as a coaching staff. [I’ll] talk to the coordinators about play time and all that. We'll have a good plan later in the week." That is a no-brainer decision, in my view. With the way Foles looked on Monday night against the Oakland Raiders, he needs as many reps he can get, particularly with Alshon Jeffery, whose game is predicated on timing throws and contested catches, as opposed to gaining separation. If the staff feels that Nate Sudfeld could also benefit from some 'real game' reps in the event he has to play in the playoffs, then sure, get him some playing time as well. But there's really very little justification for simply sitting Foles out completely in an attempt to preserve him. If he looks anything like he did on Monday, the Eagles aren't going anywhere anyway. My friend Tommy Lawlor made the astute point that the cold weather very clearly affected the play of both quarterbacks Monday night. In my view, that's not good, seeing as the rest of the Eagles' games up until they either reach the Super Bowl or get bounced from the playoffs at home are going to be played in (likely) very cold weather. Before Carson Wentz got hurt, I would have viewed the cold weather as an advantage, seeing as he is a strong-armed quarterback with running ability whose games translates well to the cold weather, even if he doesn't have much in the way of experience in the cold. And then there's the fact that the 'other' five likely playoff teams are either from warm weather cities (Rams, Panthers) or play in domes (Vikings, Saints, Falcons). The game-time temperature should be in the 20s once again on Sunday, like it was Monday night, so Foles will have one last chance to get acclimated to the cold weather before the playoffs begin. While it is clear that the offense can use all the reps it can get leading up to the playoffs, the defense bounced back from three straight bad performances against the Seahawks, Rams, and Giants to win the game Monday night against the Raiders. In my view, it makes sense to rest some of the best defensive players against the Cowboys, notably Brandon Graham, Fletcher Cox, and Malcolm Jenkins. The Eagles would also be wise to give a little extra rest to players recently appearing on the injury list, such as Jalen Mills, Mychal Kendricks, and Derek Barnett. If it were my decision, those six players along with RB Jay Ajayi would be deactivated, and I would be smart about who else got snaps on Sunday. The Cowboys will come into Philly perhaps a little disinterested after being eliminated from playoff contention a week ago, but they will still be trying to win the game. Looking ahead to 2018, the Cowboys very clearly look like the Eagles' stiffest competition in the NFC East, as the Giants and Redskins have shaky rosters as well as quarterback situations to sort out. Got any questions about Dak Prescott's tendencies against certain defensive looks? Get them on film in this otherwise meaningless game. Conversely, while they have already put 15 games on film, the Eagles should be running a very bland, vanilla game plan, specifically on offense, so as not to tip their hand on how they intend to use Nick Foles going forward in the playoffs. While the injury to Wentz was devastating, perhaps a very small silver lining is that the Eagles are now maybe slightly more mysterious to opposing defensive coordinators, who will have to guess to some degree on how the Eagles intend on hiding Foles' weaknesses. OK, so 'silver lining' may not be the way to put that.